Lauren Gulino of the Jersey Surf e-mailed us this shot. "This picture was taken after a long day of practice. 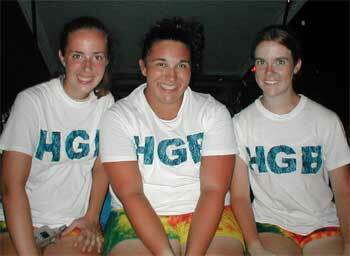 We called ourselves the HGB (Hot Girl Brass) because we were the only girls left who marched in 2002. From Left that is Meghan, myself and Holly. I can't wait to march another season with these girls. They are truly amazing."